If you’re just itching to get your orders in for the T-Mobile G2X and Sidekick 4G than Walmart and Wirefly have you covered. Walmart is ready with the T-Mobile G-Slate preorder for $549.99 or $599 for upgrades and the T-Mobile G2X preorder for $179.99 or $199.99 for upgrades. Don’t want to preorder from Walmart? 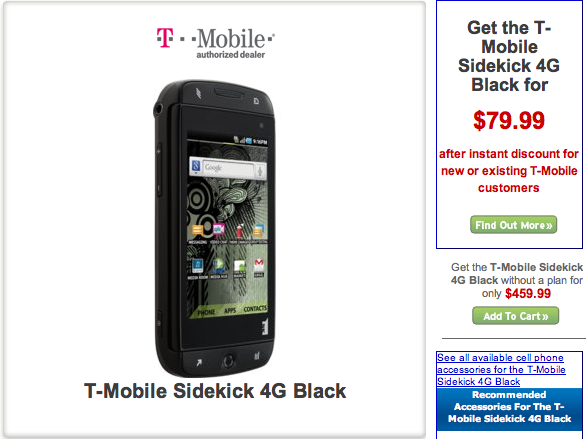 Try Wirefly where you can get your orders in for the T-Mobile G2X for $149.99 and the Sidekick 4G $79.99. Those prices are good for both qualifying upgrades and new customers. when will it available in market? They selling it way too much for off-contract. That purchase process was way too easy through Wirefly. Why deal with the stores anymore? because if you need to cancel for any reason you’ll get a double whammy ETF, one from TMO and likely one from WF. Its been talked about many times on these response boards, 3rd party retailers like that will often sneak in their own ETF on top of your TMO account. Most people don’t read it, just sign away. Gotta double check what you are agreeing to on stuff like that. Fair enough, although I’ve been with T-Mobile 10 years now, and I’m not going anywhere. I did read that before I purchased the phone, and I was fine with it. Thanks for the heads up, though. Blast! I was hoping that not many would be getting this news yet! I found out about the wirefly thing about 24 hours ago, but I’m waiting another 6 hours for my paycheck! Lol. SOOOO stoked. $79.99 FOR THE SK4G ?!!! SURE !!!!! I’LL DO IT !!!! I pre-ordered this yesterday. What I want to know is WHEN IT’LL RELEASE! Wirefly says 20th. but when I T-Mobile chatted (when I planned on buying it from tmobile.com) They said it’d ship after processing on the day you bought it. But now since its on wirefly.. It could ship on the 20th. Then 2-day shipping… then it’d arrive at my house around the Monday ( since 2 days after it plans to ship, would be thursday…friday…OHH WEEKENDD NO SHIPPING for their service)… great…I’ll end up getting my G2seXy later then expected. but its about 100 dollars less. 250 , if you dont do MIR. but then again, its 150 with wirefly. i it worth it to sacrifice a week, for 100 bucks? I have been waiting long enough, this G1 has gotta go! I have a raggedy motorola cliq that has GOT TO GO! I ordered the g2x last night via wire fly and paid 171 total! Now I am upgrading through a family plan (husbands line eligible, mine is not). So i am buying the phone thru his upgrade and am gonna put my sim card in the g2x. Was told by the tmobile rep at the store yesterday that I can do that but will forfeit the 50 rebate making the phone cost me 250 and will also forfeit the one year of damage coverage (no big deal, gonna insure it anyway), so yea… I can wait a few days to save me 80 bucks! And I had to add stuff like unlimited talk or whatever when ordering through wire fly but if that effects my bill too much, I will just go to the tmobile store and change it after i get the phone…I believe I can do that with no problem??? It was nearly impossible to comprehend all 3 of your posts. I suggest you go into T-Mobile and ask them if they’ll match prices. They’ve worked with me in the past, and if they won’t match then go ahead and order from Wirefly. I spoke with t-mobile yesterday. They told me that retailers will not get the product until the 20th so it will be shipping after that. I decided to wait until tomorrow to order through tmobile since they will start shipping tomorrow, depending on how long it takes, I might have mine before the 20th. You might not see yours until the 22nd. Q. If I place a pre-order reservation, when will my credit card be charged? A. When you submit your order, your credit card will be authorized for the full amount; however, your card will be charged only when the cell phone is activated and shipped to you. If you cancel your order before shipment, the prior authorization will be released and your credit card will not be charged. Q. If I place a pre-order reservation, can I cancel my order? A. Yes. 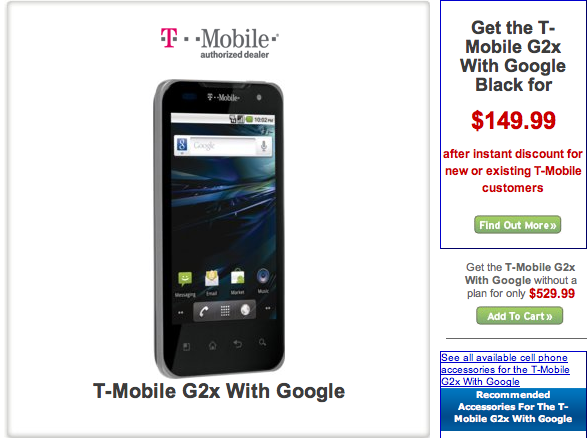 You may cancel your T-Mobile G2x With Google reservation order before shipment. Please note that phones will be shipped in the order that reservations were received. Canceling and then placing a new order will move you to the back of the queue. A. 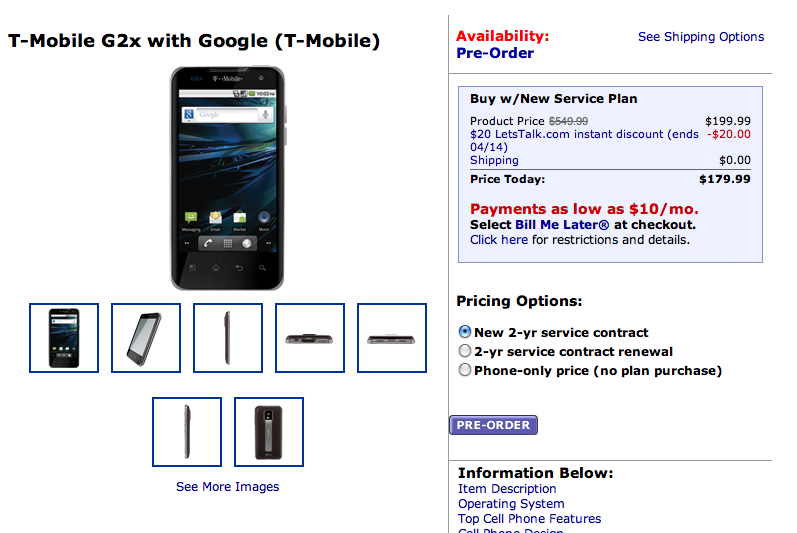 We will begin shipping orders on T-Mobile’s official launch date for the smartphone, which is currently April 20, 2011 but subject to change. If you order additional phones (such as with a family plan), we will hold your entire order until your T-Mobile G2x With Google is ready to ship. Q. If I place a pre-order reservation, will you send me updates? A. Yes, we will keep you informed as we move through the reservation and shipment process. I figured they had them but even if wirefly has them they can’t start shipping until the 20th. yeah but it’s 100 dollars cheaper from wirefly, also no stupid rebate to mail in…. Although, when I just went on T-Mobile.com and selected the best shipping upgrade they had it said “Delivery Date 4/21/11” Might as well just wait and get it in-store from T-Mobile. You’ll have it a day before anyways… doesn’t make sense though that it would be available online 4/15 but even with 3-day shipping it wouldn’t be here till next Thursday! I just called wirefly’s 1-800 number. The operator said that there was no confirmed shipping date. On another note, I was able to select “keep my existing plan” and ordered it but later on it said that T-Mobile may be charging me $18 for activation. Why does the Wal-Mart ad with the G2X say only up to HSPA+ 7.2 mbps? I thought it was 14.4??? wirefly’s deals are always great but im wondering if they hiding anything when u sign up with them? I was gonna place the order for the G2X for $150 from WireFly while extending my current contract which has a data/text bundle for $35 from when i bought my G1 and continued through my G2 but I found that after calling them they required me to modify my data/text plan to a $30/mo unlimited data and $15/mo unlimited text saying that my current unlimited plan “didn’t work with the G2X”. I called T-Mobile and confirmed that if I were to order from them they would allow me to keep my existing plan with no additional fees. I promptly went online and cancelled my order from Wirefly as that would cost me an additional $240 plus tax over two years. I would rather just buy the phone for $50 more or even full price for that matter then do that. Plus the additional ETFs and other crap just didn’t seem worth it for me. But I would say that if you don’t mind the ETF thing and you have a new contract and wont cost you anything extra, then I would say it looks like a good deal. Just look at your situation. Why does wirefly spec says, its 3D (3rd point under cell phone highlights)? Not exactly related, but Mytouch 4g FREE today with signing 2 year agreement. April14 only. I guess with new devices coming out. TMO news where are you? TMO already posted that update on Monday. That special has been running for the past 4 days..
Retentions dept. said G2x would be available to order tomorrow morning 10am pst. I have a Sidekick LX09, and since I’m losing my service they offered the 50%off select Samsung phones to me, but I’m eligible for an upgrade anyway. So they said they’d try and do “something special” for me. Retentions decided to grandfather my $20 unlimited data and just add $10 unlimited text and told me to call back to give me the best possible offer on the G2x. I was under the impression that for $30 you get all that stuff anyway? Sorry, not much of a phone guy. I just started looking at phones recently since they’re taking away Sidekick service. I liked my $20 unlimited data/text which is why I got a Sidekick iD, and moved to a LX09 to keep that plan. Either way looks like I’ll be around $70 total for 1000 mins/unlimited data/text. I just want to know if there’s a difference between my grandfathered $20data+9.99unlimited text and $30data plans. The $30 no longer includes text, that’s an additional fee. So, the $30 is only for unlimited data. Also, I would verify what the data cap is that they will be allowing you for $20. It may be possible that they are grandfathering the price and giving you a 2GB cap (before throttling), instead of the 5GB cap (unless this doesn’t matter to you). There is marketing and then there’s T-Mobile marketing. I give them another award for having the WORST marketing department in the world. This phone (G2X) is supposed to go on sale tomorrow and I haven’t seen one advertisement online or TV. Maybe AT&T might actually be good for them. This will be one of the best phones on any carrier come tomorrow but they are more busy making fun of the company about to buy them. Someone/people need to get fired. But weirdly, their price shoots up to $400 even for eligible upgrades. Lame. My Mytouch3G is begging to be replaced. Looks like this baby is my replacement. 1000 minutes , unlimited text + data for 69.99, just got my g2x and that plan for 149.99. can’t wait until its in hand! I believe that Wirefly has a disclaimer that you cannot down grade your service for the first 6 months or you have to pay a penalty fee. At least that is what i have read but you should go to their site and read their terms. i just cancelled my walmart pre order. they would not confirm when it’s shipping. leading me to believe not till the 20th. i’m just gonna call tmo from work tomorrow and order directly. plus it makes warranty issues easier to deal with if needed. I’m not saying I would actually do it, and to those who would tell me it is wrong and i’ll burn in hell.. I know.. I know.. So, I did an upgrade pre-order for the SK4G on WireFly several hours ago. Now on amazon wireless it is still showing me as upgrade eligible, which isn’t a huge surprise, since it is a pre-order and not fully processed. Theoretically, does anyone think an individual could process 2 online upgrades in the same day? My thought is that the handset pricing is dictated by that one instant upgrade check that wirefly or amazon would do, and is so automated that it would slip right through. Yes your contract would get extended twice with Tmo, but would it really matter? Let me know what you crazy kids think.